Jeremy, a four year old boy, had a good time playing in the park with his friends that sunny September day. A short time later, he came down with the common cold and, for a few days, had a runny nose and a slight cough. When his mother entered his room the next morning to awaken him, she hoped the cold would be better. But Mom was shocked to discover he could not move his right arm. She called the child’s Pediatrician and was told to come to the office immediately. It seemed it took forever to arrive at the doctor’s office. ‘We suspect AFM is a viral infection that affects the spinal cord of the nervous system. It’ a polio-like condition — it’s not polio. This condition targets the gray matter of the spinal cord; the part concerned with movement of the limbs. It comes on suddenly causing muscles of the arms or legs to become flaccid meaning weak and limp“. 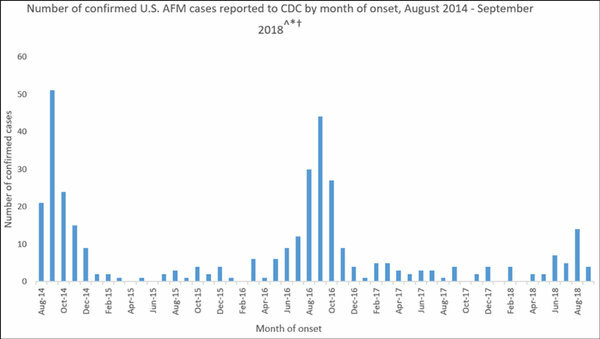 The Center for Disease Control and Prevention (CDC) has confirmed 300-400 case of AFM since 2014. Sixty two of the cases so far have been confirmed in 2018 occurring in 22 states. A respiratory virus, enterovirus-EV D68, has been identified in several children with AFM, but more evidence is needed to conclude that this is the sole cause of this condition. Acute flaccid myelitis is described as polio-like because doctors think it may be a viral infection affecting the motor nerve of the spinal cord the way polio did. Characteristically the arms and legs of children are weak with a loss of muscle tone and reflexes. Besides limb weakness, some children experience difficulty moving the eyes, drooping eyelids, facial weakness, trouble swallowing or slurred speech. Nine out of ten cases of AFM are in children 18 years of age and younger. It occurs most often in children of about 4 years of age. Clusters of AFM typically spike in September and October. The diagnosis is confirmed after doing a spinal tap and a MRI of the spinal cord in children with limb paralysis. arm and wash their hands frequently.